Beautiful, clean, steep liebacking is mixed with an intriguing crux of technical stemming. The first 25 feet has two options: either a pumpy lieback or a straight-up finger crack; both are approximately the same difficulty depending on your strengths. 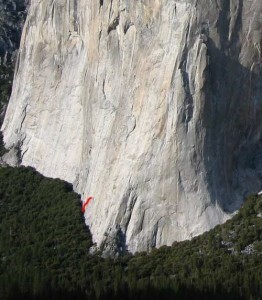 This is an outstanding and often overlooked climb. Those willing to trust the normally fixed Heart Ledges lines and capable of safely ascending ropes can jug these lines, then pendulum right to set a toprope. Which SuperTopo guidebooks include a topo for Hardly Pinnacle?